Is it the feel of the toy in the hand? Is it the slight variations in the grain of the wood or perhaps the lovely smell? Whatever it is, I am enamoured of wooden toys. But sometimes it’s difficult to find a good range at a good price. Not anymore. Whether you are after a Montessori-style toy or something that looks beautiful as well as provide entertainment, you are sure to find it in the very wide range of toys at Keepsake Toys. There is everything from rattles and teethers, through to shape sorters, balancing toys, cars and planes, and even wooden fairy wands. Personalisation is available on a wide range of the toys, and they take custom orders too. Teethers and rattles begin at about US$12, and everything is very reasonably priced. There are also a range of gift sets and gift wrapping is offered. Do you love wooden toys as much as I do? 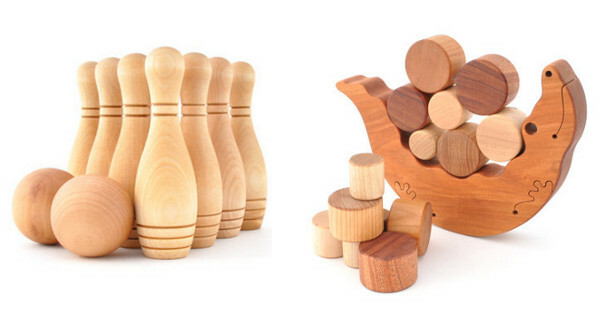 Check out our previous posts on stunning wooden toys for children.